What!? I can’t drive for how many weeks? Went to surgeon today ostensibly for sutures removal. He gave me an A+ for healing. I had followed the elevation, aspirin, and no-falling protocol religiously the past two weeks. On top of that — pure and free clean living, coupled with: a super healthy diet full of veggies, collagen rich chicken soup that my wonderful wife made, vitamin C, multivitamin, fruit smoothies with little to no processed sugar, bran muffins, eggs with low cheese, some Indian food chicken and vegetarian dishes, and only small portions of bread products, herbal teas and water… well except for the aches and pains from favoring my right leg I felt pretty good about the progress so far. Zero infection, wound, nor any other issues. BUT Doc decides he, err we my wife and I are doing such a good job adhering to protocol best to rotate foot slightly dorsiflex, cast in nicer lighter fiberglass material, and return in one week for the real deal. Well there ya have it - my first two weeks post op. 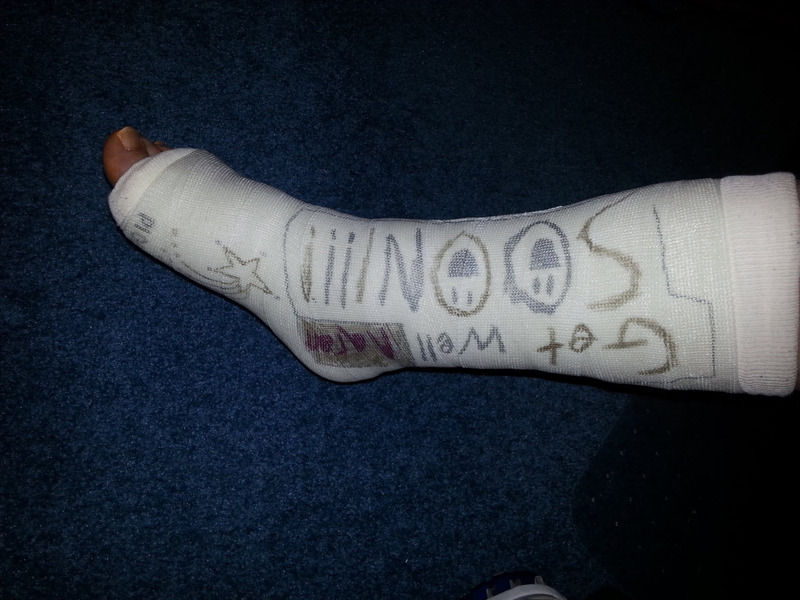 The family drew nice get well messages on my new cast:. 4/8/2014 update: one important note: Even though I had an excellent first appointment post-op with surgeon it is possible to have too much bed rest. I spent the first 7 days in bed most of the time, as in 23.5 hours per day, elevating elevating elevating, working on the laptop, then elevating some more. And the 2nd week I probably spent something close to 20 hours per day in bed. Too much, should have gotten out of bed more and used wheelchair a little less and done more crutching — because it took the whole week last week of using crutches and wheeling around the house to start to get back and able to get around and feel somewhat normal. My 30 minute car ride into work yesterday courtesy of the wife - I used crutches around the office, and took the train home. But I could only take about 4 hours of that before I was exhausted and had to head home, and that included about an hour in the break room elevating and napping on the couch. Now, after some sleeps I feel much better. So we’ll see how the cast-suture appointment goes with Doc later today. Actually we can not take it as the eventual option but we can make it as our main option which always come use in the where is default control panel windows 10. So for the better search you should put it at your desktop. I tend to just point at a random spot on the ceiling and say “I have a dashcam”. It works amazingly well at getting people to act more responsible. Awesome and interesting article. Great things you’ve always shared with us. We provide assignment help online services likes as manage the assignments in colleges and university. our website is number 1 assignment help online in USA. goldman has completed the grueling 26.2 ATR miles to full recovery! My dreams of becoming the star in the over 50 BBall league were crushed on Feb 23 2014 when a piece of ceiling tile from the gym at the Fenn School in Concord MA fell severing my right Achilles tendon. In reality: Nothing actually fell on me, but sure felt like it when my Achilles popped! Quality WordPress Theme · goldman’s AchillesBlog Copyright © 2019 All Rights Reserved.